The Southern Paiutes of Utah live in the southwestern corner of the state where the Great Basin and the Colorado Plateau meet. The Southern Paiute language is one of the northern Numic branches of the large Uto-Aztecan language family. Most scholars agree that the Paiutes entered Utah about A.D. 1100-1200. Historically, the largest population concentrations of Paiutes were along the Virgin and Muddy rivers; other Paiutes adapted to a more arid desert environment that centered on water sources such as springs. Both desert and riverine groups were mainly foragers, hunting rabbits, deer, and mountain sheep, and gathering seeds, roots, tubers, berries, and nuts. Paiutes also practiced limited irrigation agriculture along the banks of the Virgin, Santa Clara, and Muddy rivers. They raised corn, squash, melons, gourds, sunflowers, and, later, winter wheat. 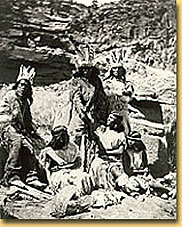 Paiute social organization was based on the family. Fluid groupings of families sometimes formed loose bands, which were often named after a major resource or geographic feature of their home territory. Paiute groups gathered together in the fall for dances and marriages. Marriage meant the establishment of a joint household and was not marked by ceremony. Although monogamy was the norm, marriage variants such as sororal polygamy and polyandry were present. The riverine Paiutes had influential chiefs with limited power based on their ability to create consensus among the group. Leadership in the desert groups was usually only task specific. Some individuals were better at hunting rabbits, or at healing, or at twining baskets, and they organized those activities. The supernatural world of the Paiutes revolved around the activities of Wolf and Coyote. Wolf was the elder brother and the more responsible god, while Coyote often acted the role of the trickster and troublemaker. Stories of the activities of these and other spirit animals generally were told in the winter. The first recorded contact between Utah Paiutes and Europeans occurred in 1776 when the Escalante-Dominguez party encountered Paiute women gathering seeds. In 1826-27 Jedediah Smith passed through Paiute country and established an overland route to California. Trappers, traders, and emigrants on their way to California soon followed. The increased presence of Europeans and their animals had serious effects on the Paiutes. The animals of the emigrants ate the grasses and often the corn that served as food for the Paiute. 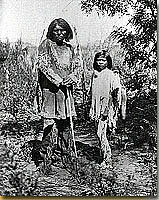 The Paiutes, especially young women and children, became commodities as mounted Utes and Navajos raided for slaves to trade to the Europeans. Although the Euro-American travelers posed a threat to the Paiutes, it was the arrival of the Mormons in the 1850s that destroyed their sovereignty and traditional lifestyle. The Mormons came to stay, and they settled in places that had traditionally served the Paiutes as foraging and camping areas. 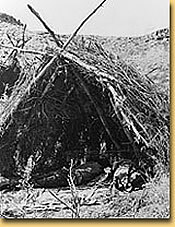 As a result, starvation and disease drastically reduced the Paiute population. Between 1854 and 1858 the Mormons conducted a fairly intensive missionary effort among the Paiutes. The Utah Paiutes and the federal government signed a treaty in 1865, but it was not ratified by the Senate. The first reservation for the Paiutes was established at Shivwits, near St. George, in 1891. Other small reservations were established by executive order: Indian Peaks in 1915, Koosharem in 1928, and Kanosh in 1929. The Cedar City Paiutes were treated as a scattered band and lived on land owned by the Mormon Church. A Paiute agency was established in Cedar City in 1927 by the Bureau of Indian Affairs (BIA). Nevertheless, very little federal help was available for the Paiutes. Paiute women worked as maids, cleaning houses and washing clothes. Paiute men worked as section hands for the railroad, did intermittent labor on farms, and sometimes worked small plots on reservation land. In 1935 the Shivwits and the Kanosh Paiutes voted to accept the Wheeler-Howard Act. Known as the Indian Reorganization Act (IRA) this legislation encouraged tribal self-governance and the protection of Indian land rights. With their new IRA governments, they received more help than before from the federal government. They were given $10,000 loans under the Indian Service Revolving Credit Fund in the 1940s. During the 1950s the Utah Paiutes became victims of the termination policy of Congress. Although BIA documents clearly recognized that the Paiutes were not ready to survive without the benefits of the trust relationship, Utah Senator Arthur Watkins included them on the list of tribes to be terminated. Without federal tax protection, health and education benefits, or agricultural assistance, the Paiutes were reduced to a miserable existence during the late 1950s and 1960s. The Paiutes filed for the land that they had lost to the Anglo settlers with the Indian Claims Commission in 1951 and were awarded 27 cents per acre in 1965. Distribution of the award money began in 1971. In 1972 the Utah Paiute Tribal Corporation was incorporated and 113 HUD housing units were built at Richfield, Joseph, Shivwits, and the Cedar City area between 1976 and 1989. Efforts toward restoration of federal status began in 1973 when petitions were circulated among the bands calling for the federal government to again recognize the Paiutes. This became a reality on 3 April 1980 when President Carter signed legislation that restored federal recognition and called for the Secretary of the Interior to present legislation for a Paiute reservation to Congress by 3 April 1982. On 17 February 1984 the Paiutes received 4,470 acres of poor BLM land scattered throughout southwestern Utah and a $2.5 million fund from which they could draw interest for economic development and tribal services. In recent years they have built new houses, operated two sewing factories, and dramatically improved their health care and educational opportunities. See: Pamela Bunte and Robert Franklin, From the Sands to the Mountain: Change and Persistence in a Southern Paiute Community (1987); Isabel Kelly and Catherine Fowler, Handbook of North American Indians, vol. 11 (1986); Martha Knack, Life Is With People: Household Organization of the Contemporary Southern Paiute Indians (1980); and Ronald L. Holt, Beneath These Red Cliffs: An Ethnohistory of the Utah Paiutes (1992).